Pardon the headline, but I had to make this fun! Working out while traveling can be a pain. Your normal routine may be out of whack, the hotel you’re staying in may not have a gym, or the equipment that you’re used to. But there are some great easy exercises you can do in the comfort of your hotel room. Especially if you plan to take a few days off from training, aim for a full body routine that will build muscle, burn fat, and also exercise your heart. Always start off with a warm-up to get your muscles loose and your heart rate pumping. Start with this quick and easy routine. For the rest of your workout, body weight exercises will be just fine. You can use your suitcase too for some added weight! Focus on working every major body part and do a circuit of sorts. Set your phone timer and have a ago at this for 15 to 20 minutes. Try to do each exercise, one after another, without stopping if possible. But stop in if you need to! Just remember you’re trying to complete as many circuits as possible within the 15-20 minutes without compromising your form. · 20 Body Weight Squats (hold your suitcase in front of you, arms stretch out for added weight) watch the position of your legs and knees! 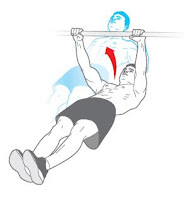 · 10-20 staggered pushups – try putting your hand on a phone book and alternate hands.This is really great for your pectorals, triceps and your abdominals. All photos taken from Google Images. Hoping the next time I can get someone to take my photos so I can post more workouts! After you get through this (you will be sweating!) don’t forget to post workout stretches to avoid injury! When you’re traveling do you make it a point to exercise? Very creative/useful tips for a workout on the road. Even if a hotel has a gum a lot of times their equipment is minimal so yeah, good workout tips! Love it! Push-ups are my thangggggg. Very clever and inspiring. If I'm lucky enough to have gym equipment at the place I'm staying, I love trying it out. I like to challenge myself while on vacation and up the ante so to speak. Otherwise, I risk falling out of the habit and slipping into oblivion. That's never any good. Good tips! I may try some of these in my regular workout. I like the staggered pushup one. I like the exercises you have put down here, which one can do without gym equipment. I think that is why I love to train at home and not in the gym. I can do my exercises anywhere I am but I like how you have adapted and did something in your Hotel room. Very well done. Thank you so much for all this information, it is very help full for me. Very useful tips for exercise. I shall keep bookmark this. I want to tell everybody about Hotels in rome. Before you begin your look for you will have to decide what type of housing you are looking for. There are many, many different kinds of resorts available, so think properly. If you are not sure what type of London hotel you really want, then think about how you see a resort. Is it just somewhere to sleep? Or do you want to remain at a position where you will meet people? Do you want your resort to be a unique location in itself? Consider these questions properly. Hi there mates, fastidious post and fastidious arguments commented here, I am really enjoying by these.